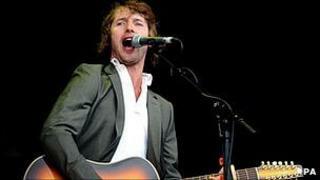 Singer James Blunt's mother has defended her son against "harsh criticism" from British critics over his public school background. Jane Blount contacted BBC Radio 4's Today programme after hearing a feature about an increase in pop stars who have been privately educated. During the report, record producer Pete Waterman said the music industry had become "snobbish". Mrs Blount said it was unfair Blunt was criticised "because of his background". The feature mentioned the likes of Lily Allen, Florence Welch and Coldplay's Chris Martin, who all attended private schools. However, Blunt who attended independent boarding school Elstree in Berkshire, Harrow School in Harrow on the Hill and the University of Bristol, was not mentioned. In an e-mail to the programme, Mrs Blount said: "I was most interested to hear Pete Waterman's thoughts on public school rock stars. "His attitude is reflected by most of the critics in the UK. My son James Blunt, who is hugely appreciated worldwide, receives harsh criticism here and we have, rather sadly, been aware that it is because of his background. "We are relieved that on the whole James's fanbase take no notice of the critics." She went on to say that his latest album, Stay the Night, "is doing so well around the world". Waterman, best known for his production team Stock, Aitken and Waterman - which worked with pop artists like Kylie Minogue in the 80s, said the argument that pop stars must now be educated was worse than it ever has been. "The major companies dominate and they see a CV and if you haven't got 96 O levels, you ain't getting a job," he said. "In the old days, you got a job in the music industry because you knew something about music. Now when they see your CV they don't take you unless you've been to university, full stop." "It's become snobbish. It's become a snobbish culture." Mrs Blount said she felt Waterman's argument was flawed. "Peter Waterman contradicted himself finally as he said that no number of exams will make you popular or successful in the music world." Today presenter Evan Davis told listeners: "We're very pleased that Mrs Blount listens to the programme."